Police and fire personnel on the scene of the recovery at Belmont Harbor. A 63-year-old man whose body was removed from Lake Michigan near Belmont Harbor in February died from drowning, the Cook County Medical Examiner has ruled. The unidentified man was found in the lake just south of the harbor entrance on the afternoon of February 9. A woman who was walking near the lake called 911 and said the man was submerged about three feet from shore. 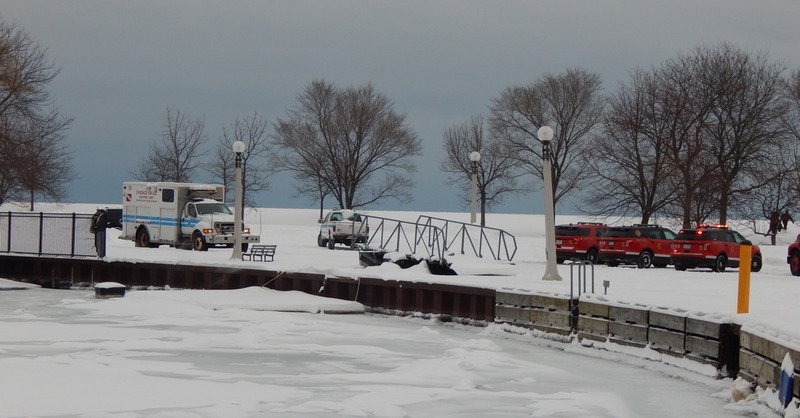 Divers battled slush-filled water and sharp ice to retrieve the man's body. He was pronounced dead at the scene, police said. The medical examiner did not rule on a manner of the man’s death. Hypothermia due to environmental cold exposure was cited as a secondary cause of death. Authorities also determined that a 25-year-old woman whose body was recovered from Montrose Harbor on May 1 committed suicide by drowning.